Please complete the form below to order free materials about U.S. currency for training, education, and consumer information purposes. Please note that many materials are available for immediate download on our Download Materials page. 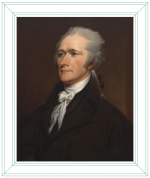 This brochure provides a brief biography of Alexander Hamilton and describes the features of the $10 note bearing his portrait. Each pack contains 25 copies. Place this card by the register to remind you of ways to quickly and discreetly check if a banknote is real. Each pack contains 50 copies. This brochure contains information about how to recognize and use security features in the $20 note. It unfolds into a poster that can be displayed in a breakroom or at a point of sale. Each pack contains 50 copies. This brochure contains information about how to recognize and use security features in the $100 note. It unfolds into a poster that can be displayed in a breakroom or at a point of sale. Each pack contains 50 copies. This informational card highlights three ways to quickly and discreetly check if a banknote is real, and also provides more-detailed information on security features and what to do if you suspect you have a counterfeit note. Each pack contains 100 copies. The Quick Reference Guide is a comprehensive resource on the security and design features of U.S. currency. This item unfolds and can be displayed next to a point of sale as an easy-to-use reference. Each pack contains 50 copies. Refer to this comprehensive guide for in-depth technical information on U.S. currency. Each pack contains 50 copies. I have read the UPS Shipping Notice and Terms & Conditions. I understand that import duties or other fees may apply to orders shipped outside the United States, and I agree that I will pay such duties or other fees if they apply to my order.